We meet again! And lo and behold, with another leftover Easter ham recipe! This is the exact reason we bought 2 you know. Just so my husband could make some of his favorites, which is an absolute pleasure to see him enjoy. This recipe was one his mom made often and so we would like to share it with you! 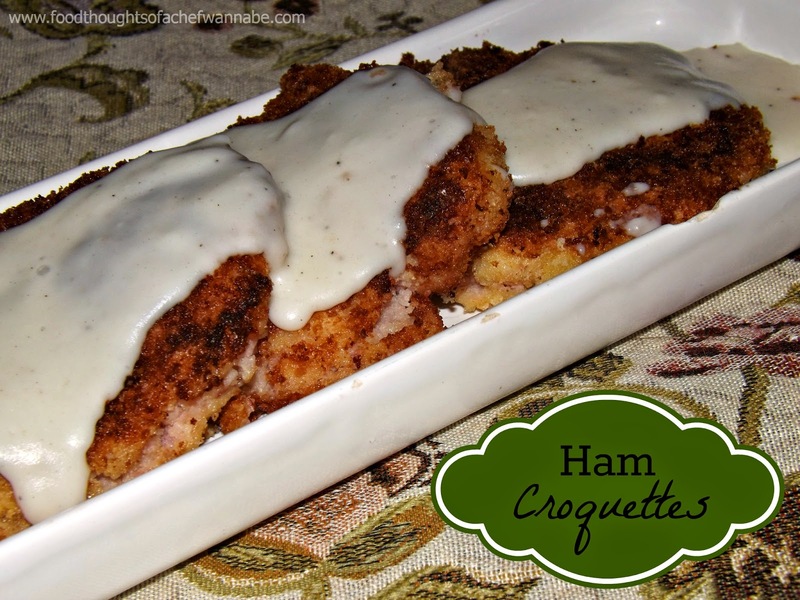 These are crispy and lovely on the outside and the inside is just ham goodness. As I had never heard of these before my husband, I did some looking around and found these to be made about a million different ways and seasoned in as many ways. These are just plain, not a lot of seasoning as the ham gets to be the star of the show. I think these might surprise you. They look like a lot of work but they are definitely not, especially if you have some mashed potatoes needing used up or just mix up some instant ones. I did not have any and just used 3 decent sized potatoes, and made a small batch. You will need a baking sheet with a cooking rack on top to put these on as they cook, or you could probably use paper towels, either way, prep somewhere to put them. I made these bigger than what I have seen, and I got about 10 patties. Make your béchamel first. In a medium pot, melt your butter, add flour and salt, and whisk for 2 minutes. Slowly add in your milk. Now you can warm your milk if you like, it will make for a quicker thickening process. Just keep whisking at a slow boil until thickened. Add in pepper and whisk to combine. When it is nice and thick, set aside. For the croquettes, in a large bowl add in ground ham, mashed potatoes, pepper and egg. Mix until completely combined. I used my cookie scoop to portion out my croquettes. Flatten them out into patties until all of the mixture is used up. You can refrigerate them at this time if you like for a few minutes but it isn't necessary. They are fragile and completely workable but might be easier to refrigerate for a few minutes first. Now get your bread station together. One plate with flour, one with breadcrumbs and a lard shallow bowl with egg. Heat up a large nonstick skillet with about 3 T. of vegetable, canola or peanut oil. Dip the patties in flour, GENTLY shake them off, into the egg and then into breadcrumbs and in the pan. Let fry on medium until golden brown and then flip. Drain on the cookie sheet you prepared earlier. Fry until all are done, and serve with the béchamel on the top! You might need to reheat a bit. Let me know if you do!! Post a picture on my social media!! I love when you all recreate my recipes! !